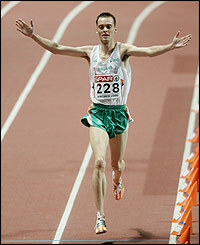 In 2012 Robert Heffernan (50k Walk) and Brian McGovern (Pole Vault) became the latest men to set new Irish records. But how do these compare to the other marks set by Irish men? James Sullivan has compiled a list of men’s Irish outdoor senior records from the strongest to weakest. Below is a ranking list of all men’s Irish outdoor senior records as at 10 September 2012, along with a brief commentary on the top 10. The IAAF points score for each record is highlighted in bold. The women’s ranking list will be published shortly. The women’s ranking list can be found here. 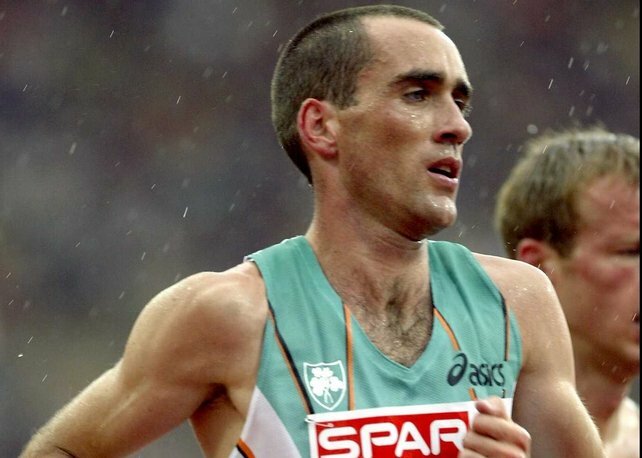 Possibly the most underrated Irish athlete in history, Mark Carroll is the second fastest non-African born runner of all time over 3000m, after Spain’s Isaac Viciosa, with a staggering performance that equates to a 5000m in the low 12:50s. Despite a European Indoor gold over 3000m in 2000 and a European Outdoor bronze over the longer distance in 1998 the talents of Mark Carroll never reached the general public to the level they deserved. Carroll was unfortunate to be competing at a time of strong East and North African emergence. Had he been around in an earlier era then Mark Carroll might now be seen as an Irish sporting icon and possibly the greatest male distance runner Ireland has ever produced. For years known as a 20k Walk specialist, in 2010 Rob Heffernan debuted over 50k with a national record of 3:45:30 en route to 4th place at the European Championships in Barcelona. The performance was all the more encouraging given the fact his training at the time was geared towards the shorter distance. Since then Heffernan has focused his preparations for the Olympic Games with the longer distance in mind and in London performed with distinction, finishing in 4th place, in 3:37:54, smashing his Barcelona mark by over 7 and a half minutes. Furthermore this clocking puts him 15th on the world all-time list for the event and would have been good enough for silver in Beijing and gold at every other previous Olympic Games. Rob Heffernan has also excelled over the shorter race walking distance, finishing 8th at the 2002 European Championships, 6th at the 2007 World Championships, 8th at the Beijing Olympic Games, 4th at the 2010 European Championships and 9th at the recent London Olympics, one week before his 4th place in the 50k. Ireland has a rich heritage in mile running, with the likes of Ronnie Delany and Eamonn Coghlan among others achieving great success over the event, both indoors and out. However, the Irish record over the iconic distance is held by one of the less heralded runners from Ireland’s illustrious middle distance past, Ray Flynn. 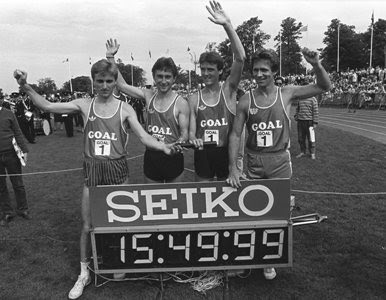 With 89 sub 4 minute mile clockings to his name, Flynn is the only Irish man to date to run under the 3 minute 50 second barrier outdoors (Eamonn Coghlan has managed the feat indoors), setting the national record at the Bislett Games in Oslo in July 1982. He was also a member of the Irish 4×1 Mile relay team which set the world record at Belfield in 1985, a record which still stands. Despite his reputation for fast times, Flynn was less successful in championships, with his sole major championship medal being silver over 1500m at the 1980 European Indoors. His Olympic best was 11th over 5000m at the 1984 Los Angeles Games. A third entry in the top 5 for Rob Heffernan who holds the Irish record over the 10000m race walk, a distance which is rarely on the race walking calender. Another athlete whose performances were quite underrated, both inside and outside athletics circles, is Nick Sweeney. 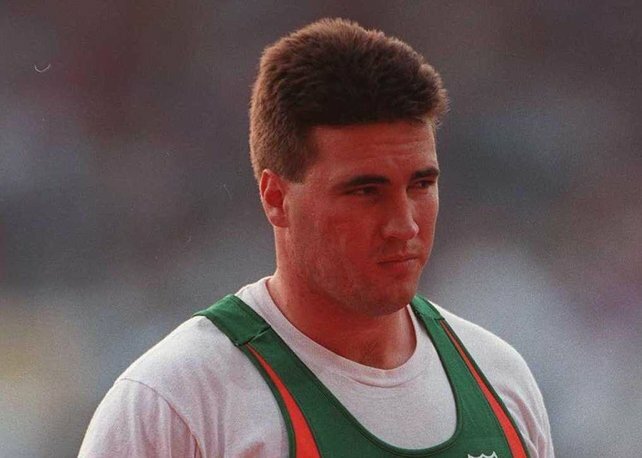 The Dubliner’s Irish discus throw record of 67.89m ranked him 6th in the world in 1998 . Unfortunately he was never quite able to replicate this distance in major championships with his best performances being 6th at the 1993 World Championships in Stuttgart and 4th at the Europeans in Helsinki the following year. He competed in four consecutive Olympic Games from 1992-2004. Alistair Cragg has had his fair share of highs and lows over the years. The South African born distance runner claimed gold over 3000m at the 2005 European Indoors in Birmingham, 4th at the World Indoors the following year in Moscow, and has twice reached the Olympic 5000m final. However the talented Clonliffe Harriers athlete has had his fair share of disappointment, with injury sabotaging a chance of European gold in 2006, along with some sub-standard performances at major championships in recent years. One particular moment from Cragg’s career which perhaps will shine above all else was his national record run over 5000m at the Brussels Diamond League meeting in September of last year. In doing so, he eclipsed Mark Carroll’s iconic 12 year old record by four tenths of a second, with a clocking of 13:03:53, the sort of time his undoubted talent deserves. A second entry in the top 10 for Ray Flynn. Amazingly his Irish 1500m record was set en route to the aforementioned mile clocking, and has celebrated it’s 30th anniversary this year. 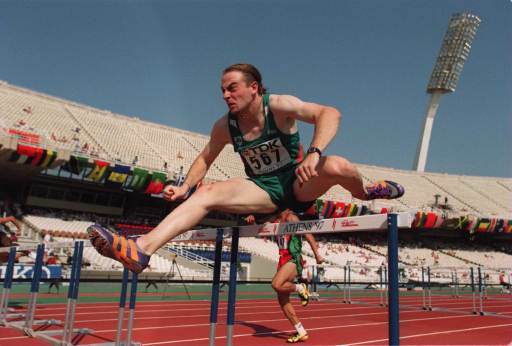 Along with 400m hurdler Susan Smith, Peter Coghlan paved the way for future Irish sprinting success. In 1999 he had a breakout year, significantly improving his personal best, and running a national record of 13.30 at Hechtel. He went on to finish 9th at the World Championships in Seville later that year, missing out on a place in the final by an agonising 0.03 of a second. At the 2001 World Championships in Edmonton he once again reached the semi final stage, finishing in 17th position overall. He also qualified for the final at the 2002 European Indoors over 60m Hurdles, and finished in 6th place. A two-time European Indoor champion over 400m, and a semi finalist at the 2007 World Outdoors, DSD’s David Gillick made his big breakthrough to world class in Madrid in July 2009 when he became the first Irish man to break 45 seconds for the one lap distance, clocking 44.77, making him the 6th fastest in the world that year. Gillick has gone on to run sub 45 seconds on five further occasions and finished 6th at the 2009 World Championships in Berlin, and 5th at the Europeans in Barcelona the following year. However he has since struggled with injury and missed the 2011 World Championships and this year’s London Olympics.